Upgrade to the magnetic back from the standard pin back, Price is per badge. Upgrade to the multi clip back from the standard pin back, Price is per badge. 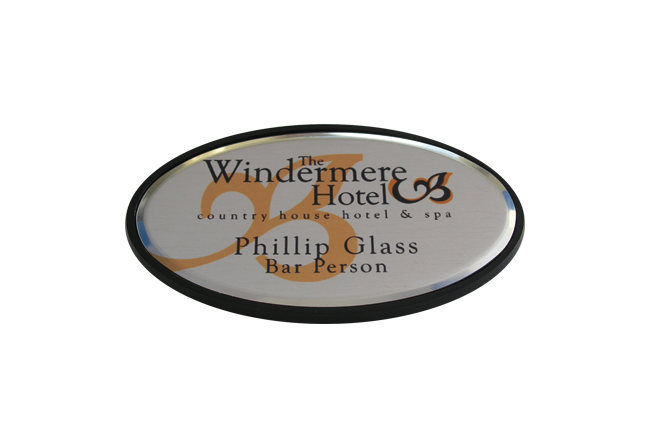 Create the right impression with our range of Black Plastic Backed Metal Name Badges, available in - Brushed Silver, Polished Silver, Brushed Gold, Polished Gold and White. Disclaimer: Due to the process used to create this product and the surface it is printed onto we cannot guarantee an exact colour match. Personalisation - A company logo and individual names/titles etc. Please note we are unable to print the colour white, anything white will be the colour of the badge finish selected. Full colour print edge to edge is not available on this product. Artwork Design - If you don't have any artwork we can create a design for you. Just email your logo together with a list of names/titles etc. Artwork Samples/Artwork Set-Up - Once you have placed and paid for your order you will be emailed your artwork sample(s) for approval before your badges are produced. Standard Pin Fastener - Magnetic and multi-clip back upgrades can be purchased at an additional cost. Fasteners are not attached. Standard Delivery on all UK order - Postage upgrades are available if you have a specific deadline to meet, we show estimated dispatch dates in the shopping basket. Staff Name Badges are one of the best ways to identify your staff to customers. These modern looking metal name badges can help create the right impression and add a touch of class to your companies image.